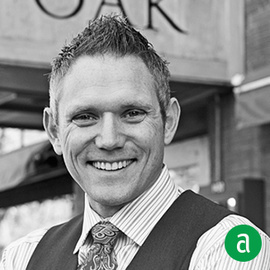 Bryan Dayton, Proprietor/Beverage Director at Oak at Fourteenth in Boulder, CO and Acorn in Denver, CO, shares his career timeline and advice for up-and-coming talent. Bobby Stuckey is a mentor and inspiration - seeing him work the floor. He’s one of the last great Maitre’D’s in the US right now. Learn to take orders and learn to do the hard work that no one else wants to - Eat humble pie from the get go. Tim Luca and Tom Sanders originally trained me - “mixology" wasn’t even a word at that point. They taught me how to stir a Manhattan and the fundamentals of making great cocktails. They also showed warmth and hospitality, the classic bartending style. I keep a healthy lifestyle in this business by running and competing in a marathon once per year. I can see in this business you can really go either way - If you're not taking care of yourself physically and mentally, you’re no good to anybody. Do your job, do it well, work hard and take pride. Success with anything you do in life takes hard work and dedication. I've learned the importance of being more open, educating my team and being a better coach. I learn everyday. Group dynamic is so hard - finding the right people to support you who you want to support back. Having good sense of humanity and good will goes a long way in business.